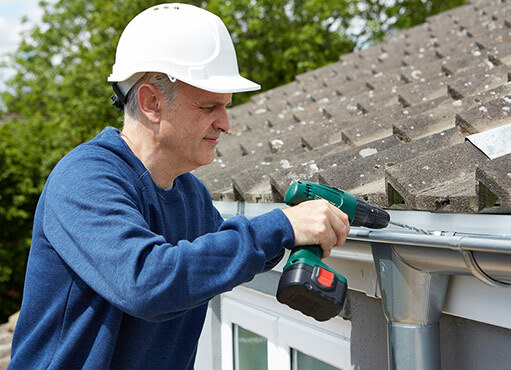 We are an established gutter repairing company and have been serving the residents of North York for more than ten years. 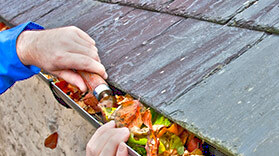 We provide all sorts of gutter repair services in the most affordable rates. So, if your guttery has been leaking lately or its outlet has blocked, just contact us. Our experts will solve all your gutter related problems in the shortest possible time. We have a highly skilled and experienced team of friendly technicians. Our technicians have WSIB coverage and our company has full liability insurance. We are the most trusted gutter repair service in North York. Gutters fail due to may reasons, such as improper installation or corrosion of surfaces with time. Leaking from gutter joints is one of the most common problem, encountered by nearly everyone. It happens when the sealing compound which holds the joints, deteriorates or fails due to any reason. Seam leakage causes many severe problems like flooding, water damage to the façade, moisture accumulation in walls. Seam leakage can be stopped by mending gutter joints. It is probably the best method to solve all leakage problems. Our technicians are highly accomplished in seam repair and restoration to its original condition. Maintenance of anything is an on-going work. It is the same in case of gutters. If you want your gutters to work properly then you should never ignore even the smallest problems. How small a problem may be, it will eventually turn into a larger problem if left untreated. Sagging gutters is an example of the most commonly ignored problem. Sagging can lead to other severe problems like seam failure, that is why it should not be left as it is. You should get your gutters inspected at least two times a year, in early spring and early autumn. Our experienced technicians provide inspection and maintenance services to deal with sagging and other similar problems. Residential gutters or the gutters of large commercial facilities are more likely to fail, especially in autumn. Fallen leaves and other kinds of trash or debris accumulates and clogs the outlet. Eavestrough start sagging due to overlaying weight and it ultimately leads to joint failure. These gutters are also more affected by the extreme weather conditions. To avoid all these problems gutters of large facilities should be cleaned and inspected more frequently than the ordinary gutters. The technicians from NICK’S Window Cleaning make it sure that the gutters of your large facilities are working at their full capacity. We complete our job within a short time. We offer the best rates along with highest quality work. Our workers work safely and make sure that your property is not damaged, even slightly. We respect the valuable properties of our esteemed customers. We provide outstanding customer service and strive to build a long-term working relation with our customers. Our team is highly experienced and well equipped with modern tools and knowledge. Each worker of our team is dedicated and works to the best of his abilities. We deliver quality work. You can also contact us for a free estimate of the work to be done. Gutter inspection or repair is not an easy task for a typical homeowner. It requires especial tools and the right knowledge. Hiring a professional is the right decision to deal with all your gutter related problems. Gutter repair work is very dangerous. Without proper equipment, you and your property are at a severe risk. Many people have been seriously injured while trying to repair their gutters by themselves. Climbing high ladders may seem a thrilling adventure to some people, but it is also probable that you will end up doing more harm than good. If you want to save yourself a lot of trouble, then hire some professional for this dirty and dangerous work. Many people think that they can save some bucks by doing this stuff by themselves but most of them will end up spending more in the longer run. We are expert in resolving all gutter related problems. We have the necessary tools required for this work, we have the right ladders and the right people. Our experts are competent and experienced in this work. Trust the experts for this work! Trust us!